Limestone is a sedimentary rock composed largely of calcium carbonate (CaCO3). 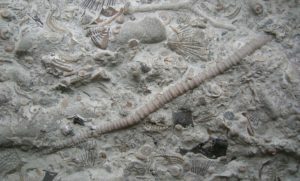 Millions of years before our era when surface area and volume of the ocean was larger, all kinds of shells and skeletons of marine life accumulated on the ocean floor and limestone was formed. Limestone is the most common rock all around the Mediterranean basin; it was used to construct cathedrals, churches and various other buildings, which still stand sturdy to testify the timeless beauty and elegance of limestone. Some examples of long standing limestone structures are Le Louvre in France; the city of Cappadocia, Turkey; and the Sphinx or Great Pyramid of Giza in Egypt. Most limestones have high absorption ratings and low abrasion resistance ratings. 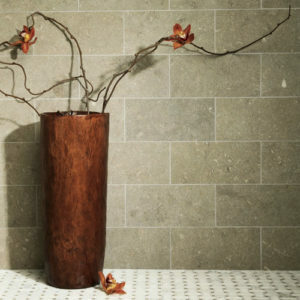 Light-colored limestone shows fewer scratches and texture damage, while darker limestone will hide stains but tends to effloresce in wet areas. Limestones will acid etch when exposed to acidic foods such as lemons, soda and wine. As a natural product, limestone requires knowledge and understanding. The most common misconception about limestone is that it’s a soft stone. In reality, limestone can range from very hard to soft. It should be chosen specifically for how it will be used in the final design, while taking aesthetic preferences into account. Le Louvre is a great example of properly installed limestone, as its floors withstand the foot traffic of 8 million visitors a year. 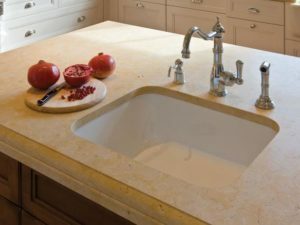 Furthermore, simple precautions and the right cleaners or sealers can keep your limestone countertop in very good condition for a long time. Can I have limestone in my kitchen/bath? Sure, why not? 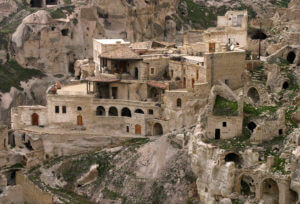 Europe has been using Limestone countertops/floors have been used for centuries. To minimize staining we recommend applying the appropriate stone sealer and re-applying when necessary. Limestone will etch if food acids come in contact with the surface. To minimize this from happening always use a cutting board, wet the counter with water near where you are cutting to dilute any acidic liquid that may get on the counter, and wipe the area down with water afterwards. 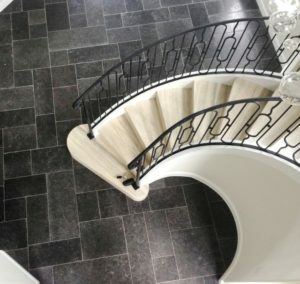 Also keep in mind that darker limestones will generally show etches more than lighter limestone, and therefore should be tested prior to your final decision. How often shall I re-seal limestone? Every situation is different. Some applications require the stone to be re-sealed annually while others can go years before re-sealing. Do a simple water test to determine if your stone needs to be re-sealed. Apply a small amount of water to the surface of the stone and let it sit for 20 minutes. If the water seeps into the stone, the sealer has broken down and will need to be reapplied. Is there anything I need to know before installing limestone? Prior to grouting: We recommend cleaning the stone and applying sealer. Once the stone is installed and grouted: re-seal the stone again. In most cases the stone will take two or more coats of sealer. Use appropriate thin-set when setting the limestone. A good anti-fracture underlay is key for the longevity of the installed. In addition, exterior applications require waterproof membrane underlay. *Click on an image for a direct link to our available inventory!